A system is required to automatically categorise any source (eg person) into a “type” from a questionnaire or other results – which can then be used for identification, focus, marketing etc. Here, a set of 19 questions (each agreement rated from 0 to 100) from 48,645 people about their attitudes towards music is taken from www.kaggle.com/c/MusicHackathon. Our aim is to group the questions to identify clusters containing similar answers, so that users can be classified. We could have more or (more likely) less groupings, but this seems a good level for marketing, reach-out and other focus. They can be combined if necessary, but good to maintain this granularity. Records are fairly clean, but best to remove users who’s responses failed to answer all questions (lazy or time-pressed answering may indicate sloppiness on answered questions) as we have enough full responses in sample. 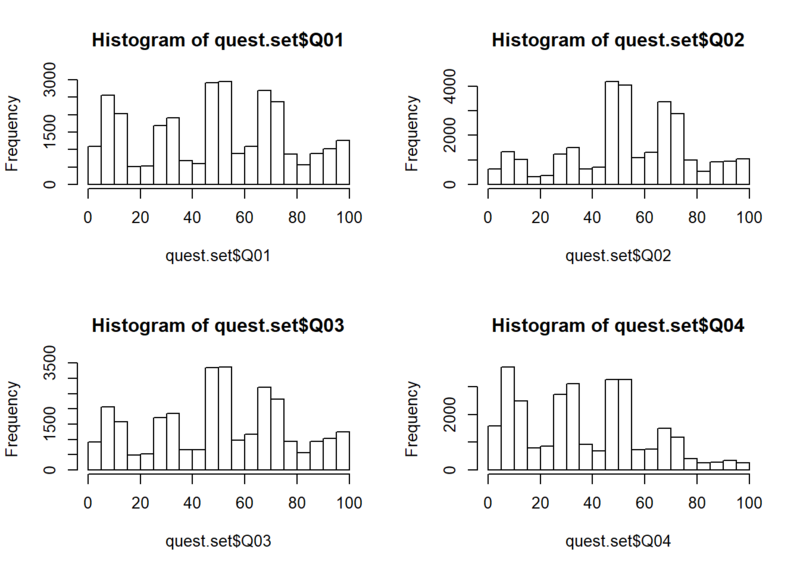 Responses are checked for normality of distribution across all scores – they all show a similar pattern and the first 4 questions are shown as histograms. These distributions are still spread across all ranges rather than centralised, but not compeletly skewed, so acceptable for our purpose of correlation and factor analysis. 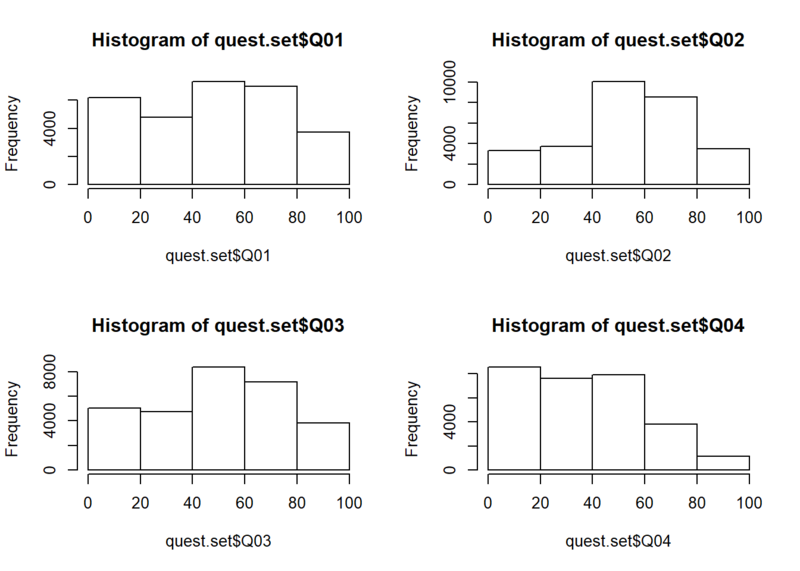 First we need to decide on number of groupings (factors) to split by, so use a Scree Plot to see how many levels are distributed. 8 levels looks like they describe most of the variation, and is recommended. More than that will be too many arbitrary groups, and less would lose some grouping which may be beneficial to identify. We can only be sure once the groupings have been inspected for meaning. 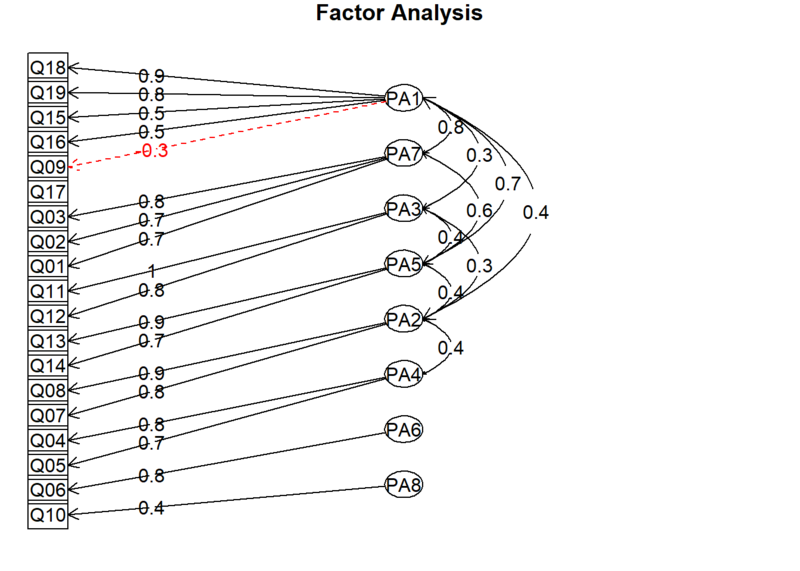 Let’s have a look at orthoganal (non rotated) Factor Analysis of the 8 groups. ## Test of the hypothesis that 8 factors are sufficient. ## Test of the hypothesis that 5 factors are sufficient. 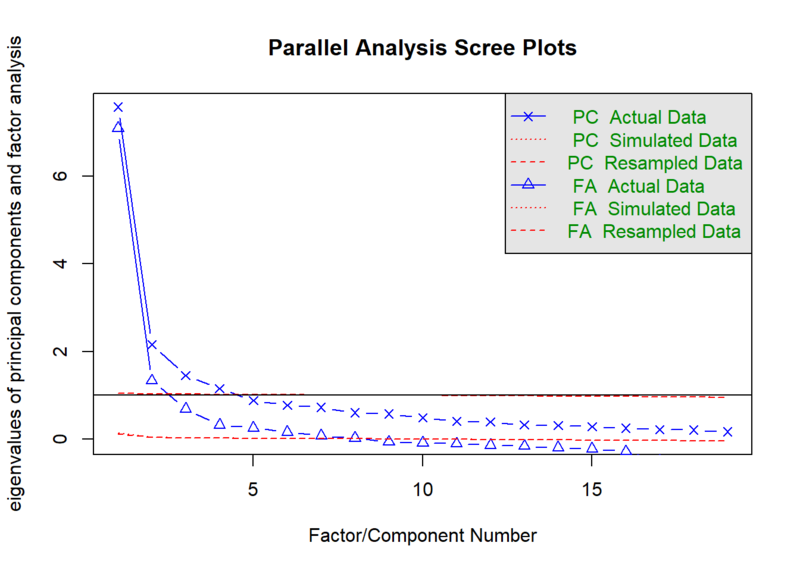 Whichever number of factors we choose, the Factor Analysis will spread the loadings across that number – it will give us a Root Mean Squared Error Approximation RMSEA and Bayesian Information Criterion BIC for comparison on the same number of factors, but this doesn’t help when needing to decide on the number of factors. It’s best to check the weightings of the PA components to see if they make sense. Before deciding, it’s best to try oblique rotated factors, which will allow weightings to be shared and improve groupings. Now we’ll try similar but with rotated, or oblique FA – first with 8 factors again. Q15 People often ask my advice on music – what to listen to. Q16 I would be willing to pay for the opportunity to buy new music pre-release. Q18 I like to be at the cutting edge of new music. Q19 I like to know about music before other people. Q1 I enjoy actively searching for and discovering music that I have never heard before. Q2 I find it easy to find new music. Q3 I am constantly interested in and looking for more music. Q11 Pop music is fun. Q12 Pop music helps me to escape. Q13 I want a multi media experience at my fingertips wherever I go. Q7 I enjoy music primarily from going out to dance. Q8 Music for me is all about nightlife and going out. Q4 I would like to buy new music but I don’t know what to buy. Q5 I used to know where to find music. Q9 I am out of touch with new music. Q6 I am not willing to pay for music. Q10 My music collection is a source of pride. Now we have more controlled groupings, check them against basic variable correlation to ensure validity. 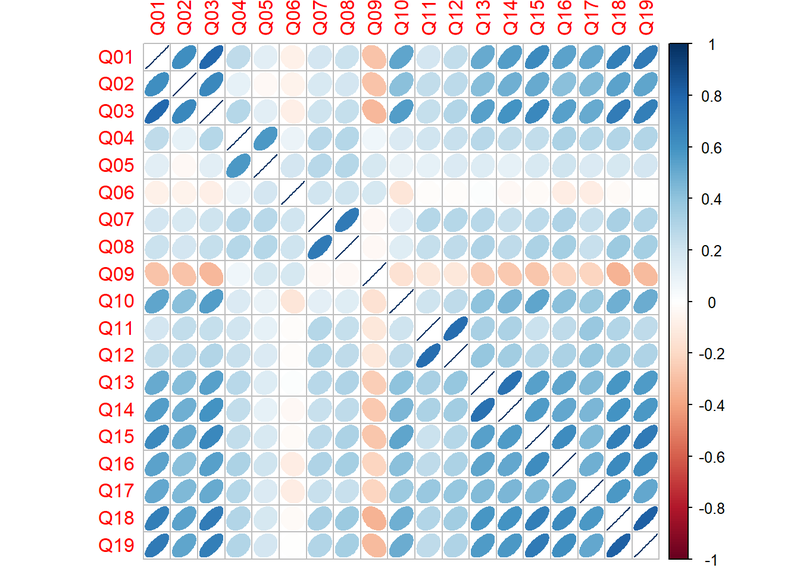 Tracing the connections, we can see that our EFA groupings do correspond to the variable correlations – eg. Q7 and Q8 strongly correlated, so is the grouping of Q1 with Q2, Q3, Q10, Q15 and Q18 (with negative correlation to Q9). 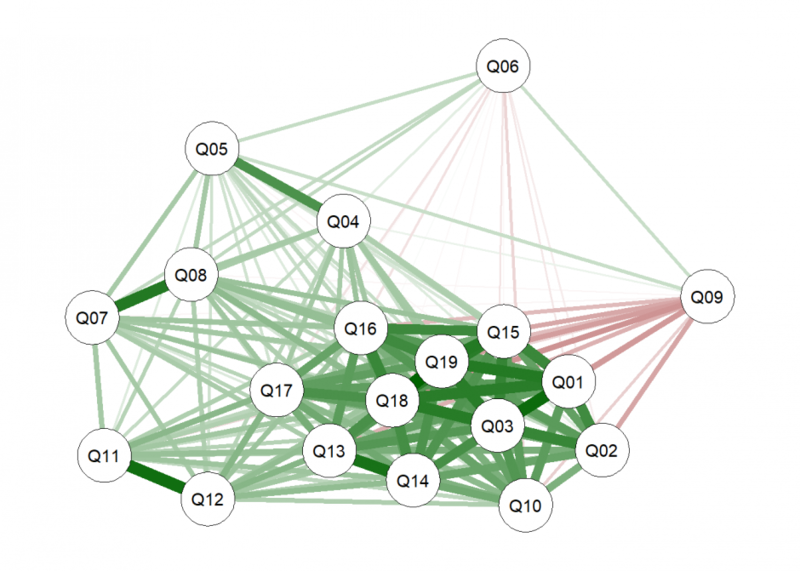 This is confirmed further with a network graph, where we can see the strength as well as connections. Several methods could be employed to group questions from their responses, for example various K-Means algorithms. However, EFA was chosen as it’s fast and in this case, effectively grouped the Questions into understandable categories.